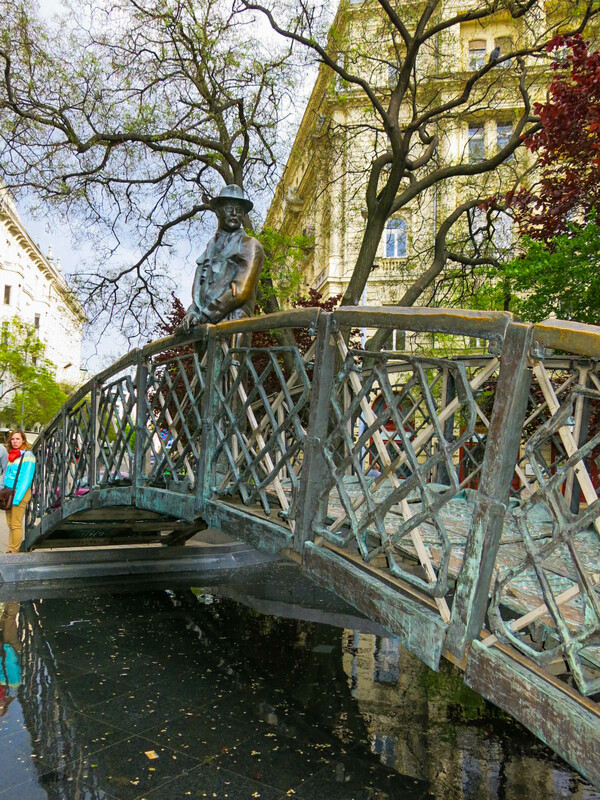 Hungary’s capital city, Budapest, is known for its scenic settings and architecture. But it also has a unique youthful atmosphere, classical music, thermal baths, numerous art galleries and its lively nightlife. Budapest is often said to have a split personality, most likely because of its tale of two cities: Buda in the west and Pest in the east. The historical sites of Buda and Pest are split by the mighty Danube River, which originates in Germany and flows southeast for 2,872km to the Black Sea. The city is also divided into 23 numbered districts that spiral outwards from the city centre. Hungary was heavily involved in both of the world wars, triggering the First World War as part of Austria-Hungary against Serbia and then allied with Nazi Germany in the Second World War. After the wars, Hungary was occupied by the Soviet Union and under communist rule until a republic was proclaimed in 1989. Hungary is now a free country undergoing rapid change and political reform. There are many monuments and memorials that remind you of Hungary’s participation in WWI, WWII, their reliance on Soviet Russia and their recent communist past. The building opposite Parliament House still has bullet holes from the Hungarian Revolution of 1956, which lasted 18 days and claimed thousands of lives of the civilians who protested and the Soviet soldiers. The Hungarians of Budapest are very creative and arty. There are many galleries and art museums to enjoy throughout the city, but even some of the buildings, monuments and memorials are thought provoking and moving. The Jewish Quarter, just west of the city centre, is full of impressive synagogues and kosher bakeries by day and fantastic nightlife after dark. Check out a ruin bar. The younger generations are hopeful and always looking forward, but very conscious of their communist past. Atop Castle Hill, you can visit Buda Castle (the Royal Palace), Fishermans Bastion, Matthias Church and the Hospital in the Rock Museum amongst tourist high end cafes and (possibly overpriced) markets. Currently the Royal Palace (aka the Buda Castle) is the home of the National Gallery and the Budapest History Museum art gallery. If art is not your thing: skip the inside of the Palace and enjoy the amazing view of Budapest from the outside. The courtyards of the Buda Castle are open 24/7. Around the Royal Palace you will discover a range of markets, viewpoints and the old town where buildings stand and ruins remain a reminder of what was. A short walk north from the Royal Palace is the very colourful Matthias Church (above) and Fishermans Bastion overlooking the Danbue and Parliament buildings. 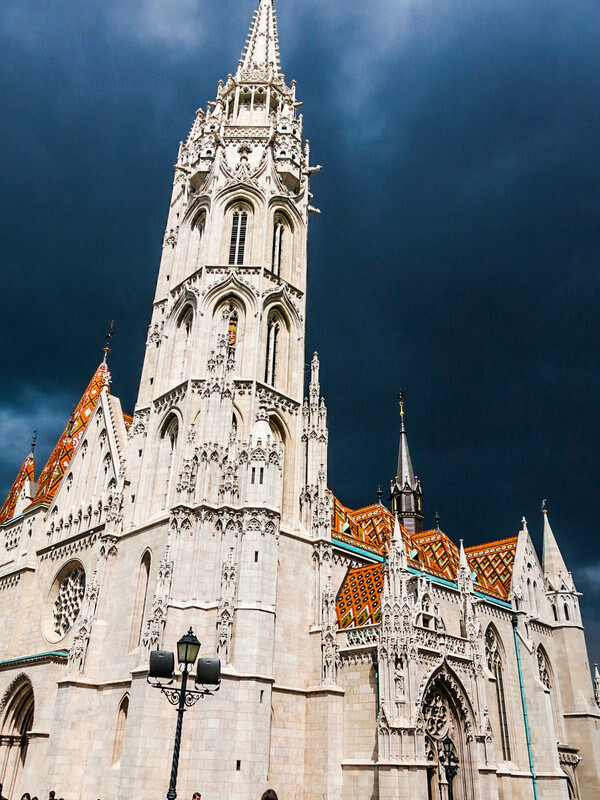 The beautiful Matthias Church was commissioned in the 14th century and restored in the 19th century. The Hospital in the Rock Museum is situated on the opposite side of Castle Hill to Matthias Church. It was extensively used in 1944-45 during WWII and in 1956 during the revolution. Several thousands of people found shelter here and were cured by the doctors and nurses. Many of them died though due to the shortage of water and lack of medical supplies especially during the last month of the siege of Budapest in January 1945. A tour takes about 60 minutes and covers the historical wartime hospital and the cold war bunker. There are several ways you can travel between the top of Castle Hill on the Buda side to the Pest side of the Danbue. There are several tourist buses, but for only HUF 1.60 you can buy a paper ticket to catch the local bus, number 16, from the top of the hill to Vorosmarty Square near the city centre. Alternatively, you can catch the Funicular (cable car) or take a short, winding stroll down the hillside to the Chain Bridge. The Széchenyi Chain Bridge (above), a suspension bridge that spans the River Danube, was the first permanent stone-bridge connecting Buda and Pest, and only the second permanent crossing on the whole length of the river Danube. It is one of the symbolic buildings of Budapest. You will notice a city centre that it is much flatter and much easier to navigate. Most of what you might want to see is within walking distance or only a few stations away on the easy to use Metro. Vorosmarty Square in the centre of Budapest has an array of Hungarian markets throughout the year, but the Square is also the location for Christmas markets during December and Easter markets. You can also find a range of free walking tours starting (mainly run by Sanderman’s) from the water fountain of Vorosmarty Square. Along the river you will also see the beautiful Hungarian Parliament Building (above). The Parliament building is quite striking against the expansive river and Chain bridge. Visits to the Parliament are only permitted in organized groups led by our tour guides. A tour takes approximately 45 minutes – including the security check. 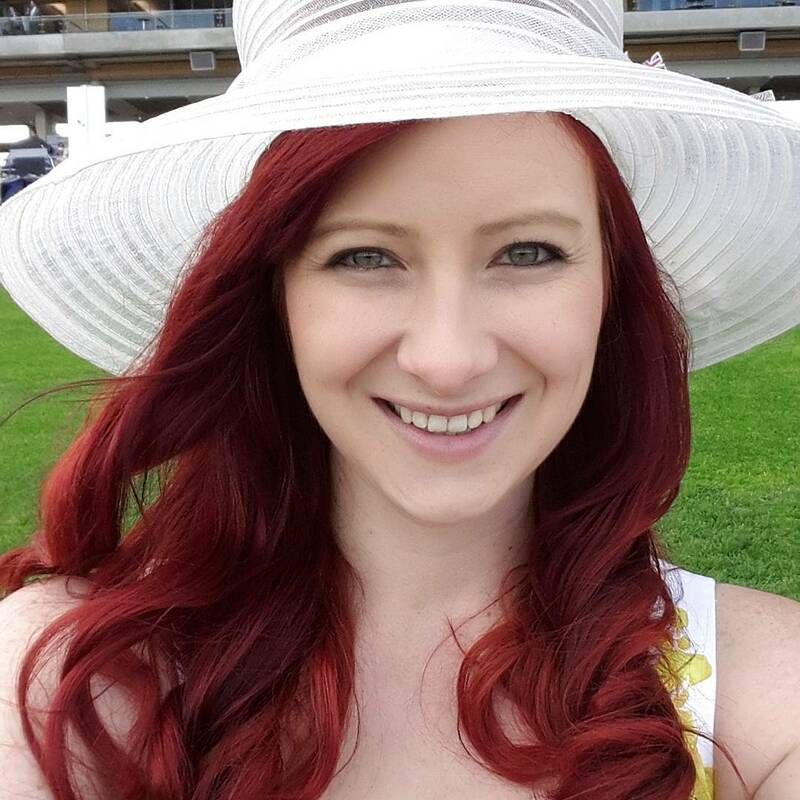 It is good to book online in advance as purchasing limited tickets on the day can be time consuming. Take a moment to walk behind the Parliament building to Vértanúk tere (Martyrs’ square) where you will find a brass statue of a man standing on a small bridge (above). He is wearing a hat and a trench coat and is looking pensively over his left shoulder, into the distance. The man is Imre Nagy. In 1956, Nagy was nominated by the people to become the new Prime Minister during the revolution. The bridge is said to represent bridging the divide between communism and democracy. Along the Pest shore of the Danube River, about 300m (980 ft) south of the Hungarian Parliament Building and near the Hungarian Academy of Sciences, you might suddenly come across hundreds of brass shoes facing the river. Take note of these shoes. They are a memorial to the Jews that were rounded up, tied together and forced to drown in the freezing river. To save money and resources, they were made to take off their shoes and only one bullet was used to kill one of the twenty tied together and pushed into the river. Take a moment. On the Pest side, away from the Danbue River is St Stephen’s Basilica (above). 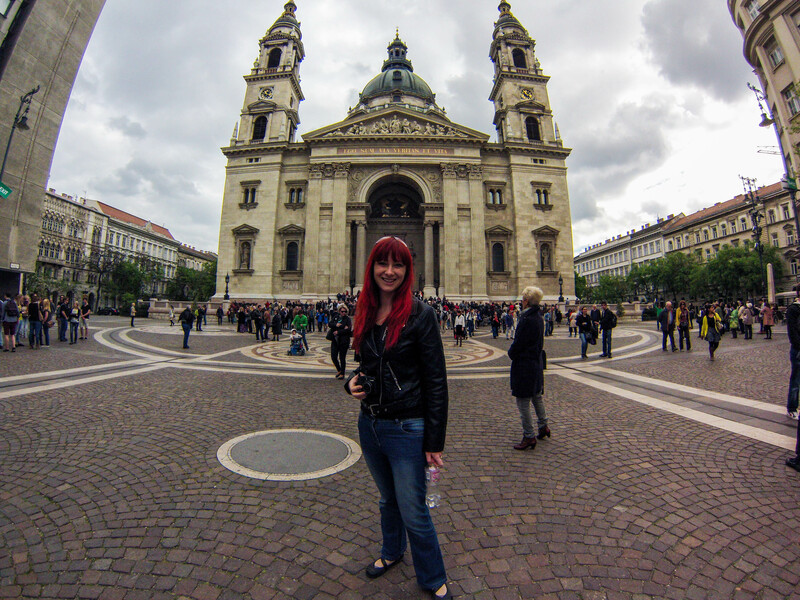 This enormous Catholic Church in the middle of Budapest is named in honour of Stephen, the first King of Hungary. You can enter the church and take in the glorious views from the top, or find the mummified hand of St Stephen himself housed in the reliquary. The spacious St. Stephen Square offers plenty terraced cafes and bistros to people watch by a cup of coffee. The further east you travel the further into the Jewish quarter you will find yourself. There is a great mix of kosher bakeries and Hungarian restaurants and touristy cafes to tempt any taste. After dark, this area becomes crowded and full of all sorts enjoying the nightlife. 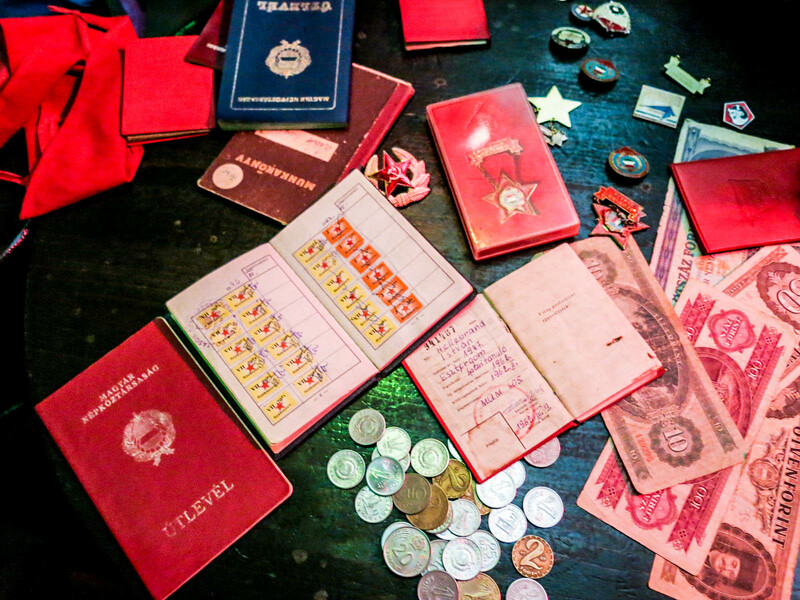 There are plenty of bars to choose from, but Gozsdu – Udvar is an alleyway full of pumping restaurants that open up a dance floor space after 10pm. There are also several bars and clubs along Kazinczy utca. If you are interested in the ruin bars, which I highly recommend, check out Szimpla Bar (above) on Kazinczy utca or Instant on Nagymező Street. Ruin bars are old, rundown buildings that have been converted into large bars with a rabbit warren of hangout areas across several different levels. Each room is decorated differently and randomly. Drinks are cheap compared to London standards, but expensive for Budapest. Try the smaller and less touristy bars for a cheaper pint. Andrássy Avenue (Andrássy út), often referred to as the Champs Elysée of Hungary, boasts some of the finest shopping that Hungary has to offer and is now a world heritage site. This long street stretches from Erzsébet tér to Heroes’ Square and is also home to the Hungarian State Opera House, the House of Terror, the entrance of the City Park, The Palace of Art, the Museum of Fine Arts and also contains many fine cafes, restaurants and theatres. The House of Terror (above) is halfway along Andrássy út, a 20min walk or 2 metro stops from the city centre. This is the building that the Nazi’s occupied until the ÁVG and ÁVH (The State Protection Authority or Államvédelmi Hatóság) took it over as their headquarters during the communist reign. The building has been converted into a museum and memorial to those that suffered through the terror of these times and specifically to remember those that were tortured in the basement of this very site. The exhibition contains material on the nation’s relationships to Nazi Germany and the Soviet Union. 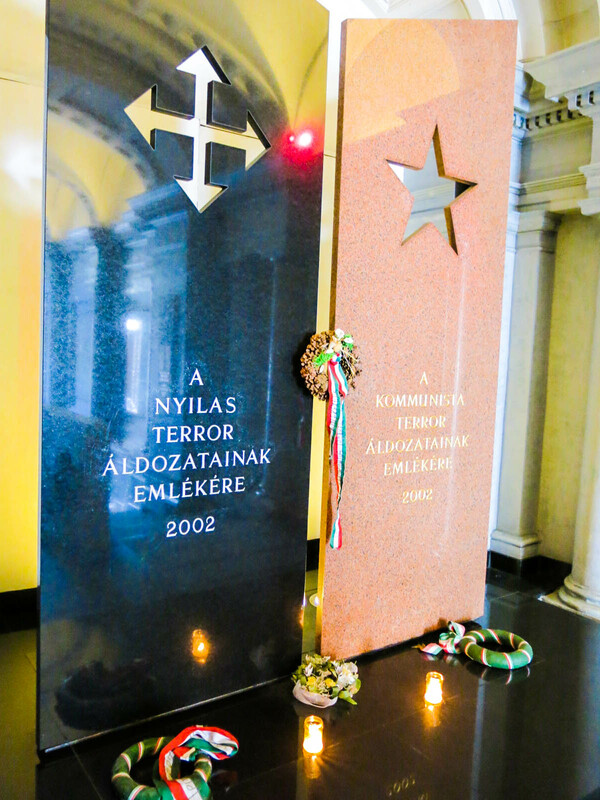 It also contains exhibits related to Hungarian organisations such as the fascist Arrow Cross Party and the communist ÁVH (which was similar to the Soviet Union KGB secret police). Part of the exhibition takes visitors to the basement, where they can see examples of the cells that the ÁVH used to break the will of their prisoners. The House of Terror is well worth a visit, but be warned that it can be a depressing and sobering experience. Since most of the museum is in Hungarian, I recommend the audio guide to get the most out of your experience (Audio guide: HUF 1,000). Heroes’ Square (Hősök tere) is home to Budapest’s iconic Millennium Monument, the Museum of Fine Arts, the Palace of Art and statues featuring the Seven Chieftains of the Magyars and other important national leaders, as well as the Tomb of the Unknown Soldier. It is also the main entrance to City Park, home to the Vajdhunyard Castle and Szechenyi Bath. An ice rink also opens up to skaters on one of the lakes during the winter. Szechenyi Baths (above) is a great local tradition. Built in 1913 they were open as public bathhouses. Now, men and women can enjoy the baths at all times of the year. There are three large outdoor pools varying in temperatures from 18 degrees to 30 degrees. Components of the thermal water include sulphate, calcium, magnesium, bicarbonate and a significant amount of fluoride acid and metaboric acid. Inside there are 15 indoor baths that have varying minerals and temperatures. Some baths will be closed during certain times of the year and others will be closed from 7pm each evening. Szechenyi Baths and Pool is famous for its summer night spa bath parties (sparties). On Saturday nights the outdoor baths open up to ticket holders for a night of raving and drinking. Tips: Be wary, we heard that the lockers were not that secure, even when locked by your wrist band. You will also be asked to lay down a deposit per towel, which you will be refunded upon its return. Note: baths are mixed male and female. A swimsuit is essential and you are asked to shower in separate male and female locker rooms before entering the bath area. Memento Park is an open air museum in Budapest, dedicated to monumental statues from Hungary’s Communist period (1949–1989). Known in Hungarian as Szobor Park (simply Statue Park), it was officially opened in the autumn of 1993 on a site about twenty minutes from central Budapest. The Communist era statues, with the exception of a statue of Stalin that was smashed in the ’56 revolution, have been re-erected in an “outdoor museum”. Freedom Square, near the Hungarian Parliament Building, is home to a series of monuments, including one of the very few remaining Soviet monuments in Budapest. The large and intrusive monument honours the soldiers of the Red Army who died in 1944-1945 during the liberation of Budapest. In 2011 a statute of former president Ronald Reagan, was created to honor Reagan for his role in bringing an end to the Cold War. The statue strangely looks over the Soviet monument in an almost comical way. The Budapest Card offers plenty of discounts for visitors travelling to the city: unlimited use of public transport, free guided tours, free downloadable audio guide, and free or discounted entry to several museums including the History Museum and National Gallery. A 24 hour card is HUF 4,500, a 48 hour card is HUF 7,500 and a 72 hour card is HUF 8,900. Budapest’s public transportation systems are operated by the company BKV. The service includes buses, trolleybuses, trams, underground trains (Metro) and above-ground suburban trains (HÉV). Buses, trams and trolleybuses run daily from 4.30 a.m. until 11.00 p.m. Tickets or passes must be bought before boarding at Metro stations, tobacconists and newsagents, and from vending machines in the city centre. The single tickets are valid for one single journey of any length (without changing) on all routes. Budapest has an excellent night bus system on which you can buy tickets all night. Cabs in Budapest are marked with the word “Taxi”, often accompanied by a company name / logo such as “City Taxi”. All taxi vehicles must have a yellow registration plate. A basic fee is HUF 450 and the per km charge is HUF 280. Located approximately 16km south east of the city centre, the Budapest Ferihegy International Airport (BUD) is the only airport that services Budapest. The Budapest Airport Minibus is a door to door and reasonably priced (approximately HUF 3,200 per person) between the airport and the city centre. The public airport bus, BKV bus number 200E goes to M3 station Kőbánya-Kispest (blue line), about 20 minutes away. From here, the metro takes passengers straight into the city centre. Depending on your driver, a taxi to the centre of Budapest will cost anything between HUF 3,500 and HUF 9,000. Be sure to get a registered yellow taxi. Trains also commute between the airport and Nyugati Railway Station, 51 times daily on weekdays and 38 times a day on weekends and holidays. The train ticket price is about HUF 370- HUF 700 per person. There are 3 main international railway stations in Budapest: Eastern (Keleti), Western (Nyugati) and Southern (Déli). All three international railway stations are part of the Budapest Underground system, the Metró. Budapest has direct railway connections with 25 European capital cities, and there are more than 50 international trains departing daily. Trains to Vienna run every 3 hours, 7 times a day. There is also a popular network of Inter City trains linking Budapest with the main Hungarian towns. The international and domestic bus services depart from and arrive to the Népliget bus station. Other domestic bus stations are at Árpád híd, Stadionok in Pest, and Etele tér in Buda. Volánbusz Rt. has scheduled passenger coach services to and from many European countries. Hungary has 5 motorways and 4 main roads, eight start from Budapest (exception: main road No. 8). For using the following motorways you have to buy a motorway sticker: M1, M3, M5, M6 and M7 (available at border crossing points and at petrol stations). A hydrofoil service operates between Budapest, Vienna and Bratislava in the summer months of the year. There are three international piers on the river Danube in Budapest. Looking for more travel inspiration or destination guides? 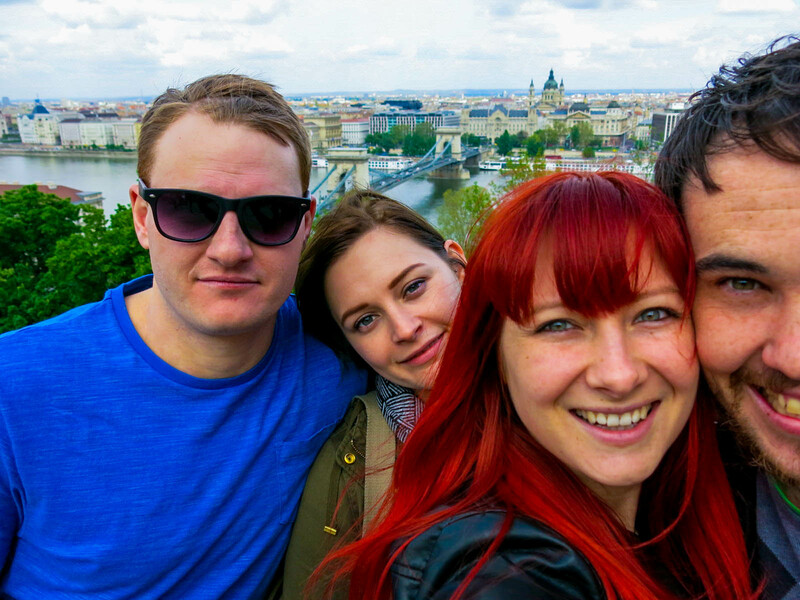 Check out my recommendations on what to do in: Amsterdam, Bali, Berlin, Brisbane, Bristol, Budapest, Cambridge, Canberra, Cappadocia, Chamonix, Copenhagen, Dubrovnik, Istanbul, Kotor, Kyoto, London, Madrid, New York City, Paris, Riga, Scotland, Tokyo, and Washington D.C.